Wood is a fascinating material. From an early age, we become familiar with its smell, texture and warmth, yet we are seldom challenged to re-invent how to work with it. The sinuous Wander Wood pavilion at UBC is made up of I-beam-like wood elements that attach to each other through their flanges, which are overlapped and riveted together. Since 2016, the three of us have led a team of researchers, students and professionals in creating full-scale pavilions at the University of British Columbia that explore new ways to design, fabricate and assemble wood. Wood is a natural partner for digital fabrication technologies because of its ability to be easily milled and shaped. 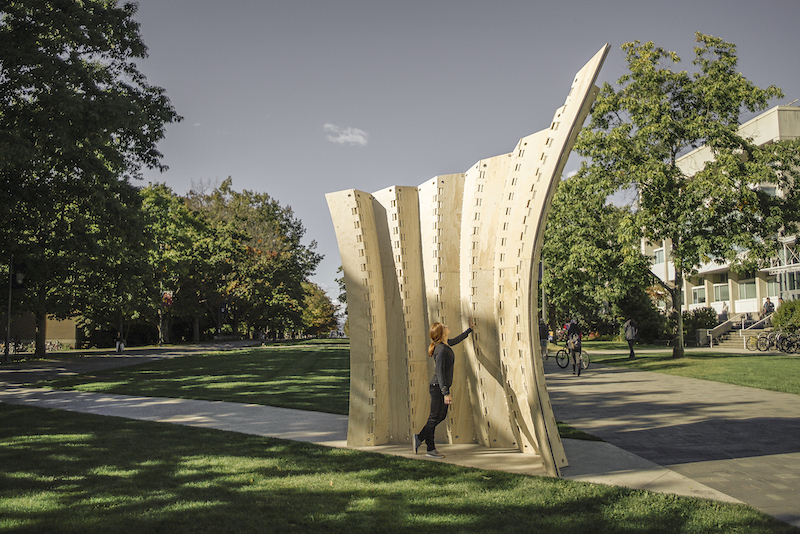 These experimental structures demonstrate the capabilities of digital technologies to be used with wood in innovative ways that celebrate the material’s unique properties and potential for formal complexity. This pavilion resulted from a first workshop, in 2016. Wander Wood, the third of these pavilions, completed last fall, is sheathed with rows of overlapping wood tabs, which change in shape to create a rounded form that rises to a peak. 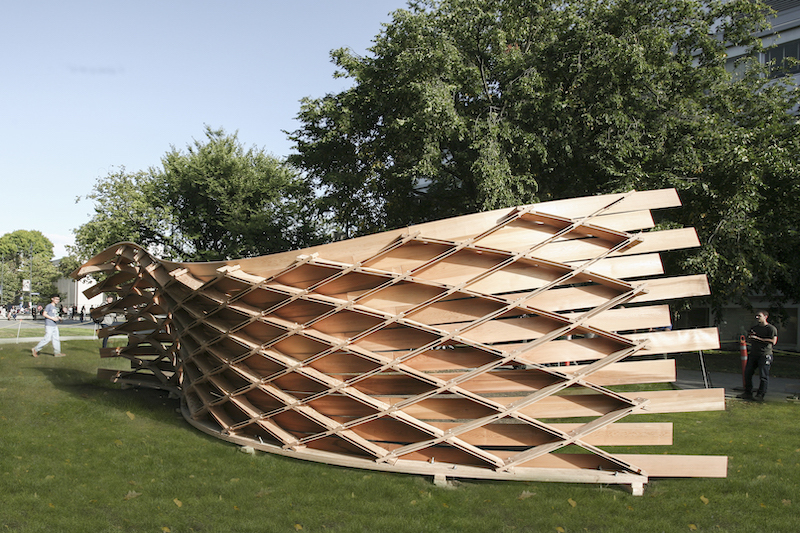 The pavilion implements the structural principle of a stressed skin, a system used in airplanes, where internal ribs form a template covered by thinner members elastically bent to form (or compute) the final shape. A public bench along the inner edge of the curved pavilion invites passersby to come inside for a closer look. The 2017 pavilion from the workshop series hosted by UBC. 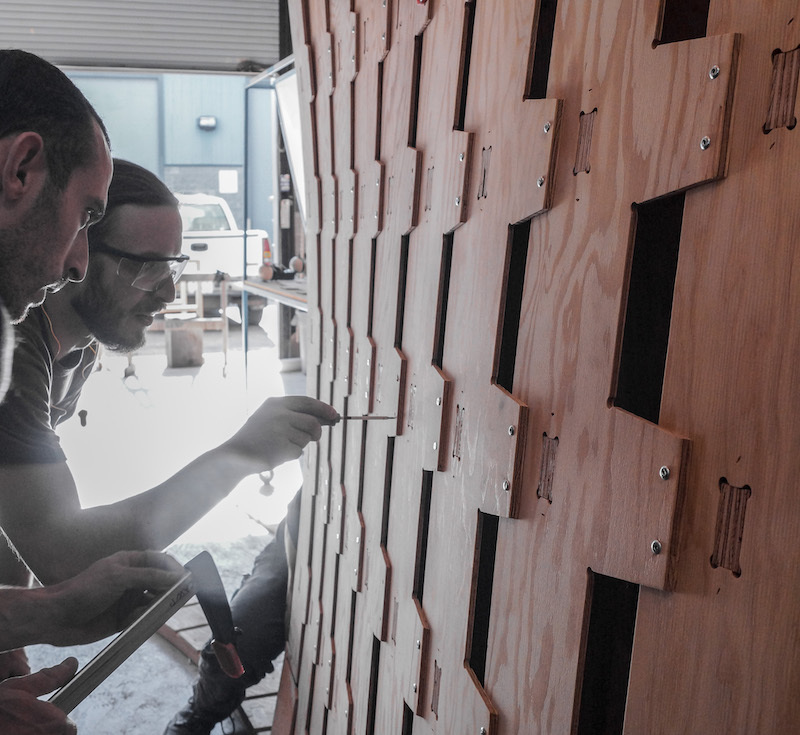 The individual pieces of the Wander Wood pavilion were milled using a state-of-the-art industrial robot, interlocked into place, and fastened together with metal rivets. Each individual component is embedded with enough assembly information to ensure exact placement of every subsequent piece, allowing for quick assembly on site. 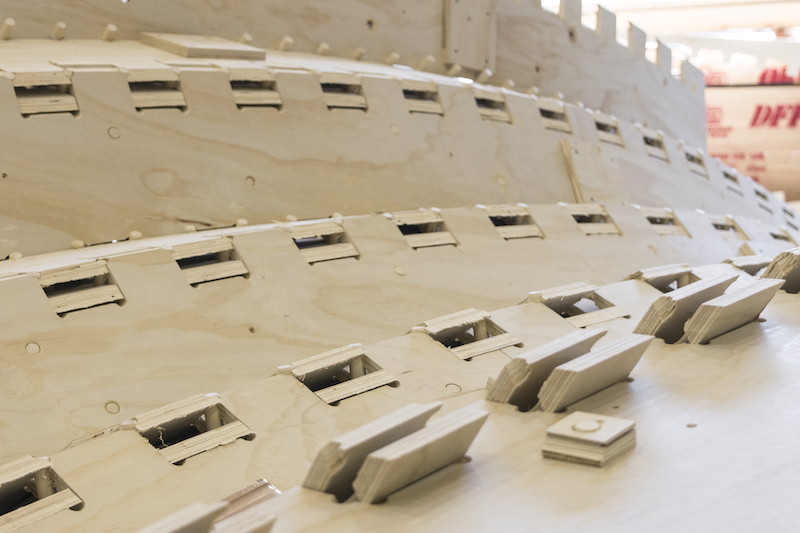 The geometric processing power of visual scripting was key in the design in order to define and manage 40 ribs, over 200 overlapping skin elements and 2,200 rivet perforations. The first step was to craft a robust workflow that enabled design iteration while ensuring the rapid output of precise geometry for fabrication. The result achieves the design vision while accounting for the material’s maximum bending radius and load transfer capacity, and the fabrication envelope of the CNC robot. Robotic machinery at work in the manufacturing of the 2017 pavilion. 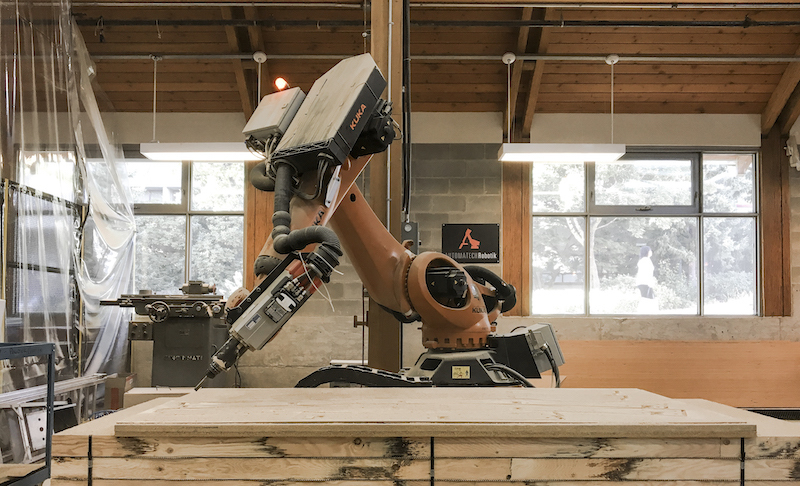 The design and development of the pavilion took place as part of a large-scale robotic timber fabrication workshop hosted by SALA and the UBC Centre for Advanced Wood Processing, which involved 15 UBC students and 22 professionals. Fabricated and assembled over three days, the pavilion is conceived as an adaptable design-to-fabrication system that can be customized to suit local material availability and fabrication tools. This type of hands-on building and fabrication experience gives practicing architects and designers a unique insight into the disruptive position that digital fabrication technologies may have within their own design work. A close-up of the 2018 pavilion. The intrinsic role of the architect is to be knowledgeable not only about structural and tectonic aspects of architecture, but also about the processing techniques behind materials and building elements. As such, the dissociation of building and making that occurred in the 20th century has become an increasing challenge for the profession. Digital design can further the distance between the physical and the abstract—or it can re-engage the latter through new methods of making. Our research work has repeatedly made us aware of the innovative potential of fabrication tools within a deeply rooted material practice. A manufacturing detail from the 2016 pavilion. David Correa is an Assistant Professor at the University of Waterloo and a Design Partner at IILab Design Laboratory. Oliver David Krieg is Director of Technology at LWPAC + Intelligent City. AnnaLisa Meyboom is Associate Professor at UBC’s School of Architecture and Landscape Architecture.